All prices include basic programming and 12 month telephone support / RTB warranty. Finance available, lease / purchase. Includes set up and new batteries fitted. Available in 5 different colours ( subject to availability ) High visibility LCD display front and rear, with thermal receipt or journal roll and compact drawer. Ideal for retailers who are limited to space i.e. hairdressers. 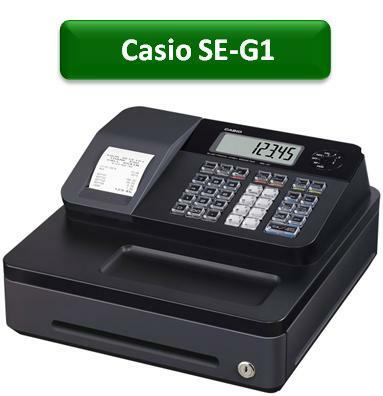 Click here to go to the Casio website for technical details about this machine, or click the .pdf logo for the brochure. Includes setup and new batteries fitting, ideal for businesses in the hospitality sector. Features also include journal or receipt printing on a thermal printer, rear customer built in display and 4 levels of tax extraction, i.e. 20% vat, 5% vat and 0%. 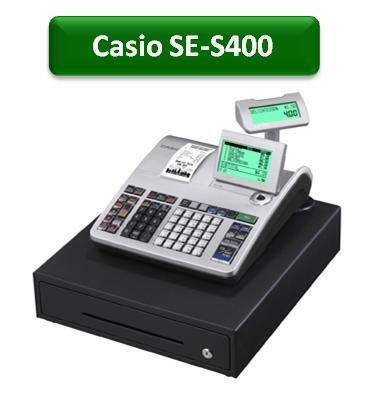 The Casio SE-S400 is a single, thermal roll cash register with 25 raised department buttons. This machine is ideal for small to medium sized retail environments that require control of a growing business. Featuring a host of benefits including review previous sales, pre-set cash amount tendered keys, clerk interrupt and electronic journal memory. This machine is excellent as an entry level scanning terminal (3,000 stock items) with the added benefit of creating items on the fly. 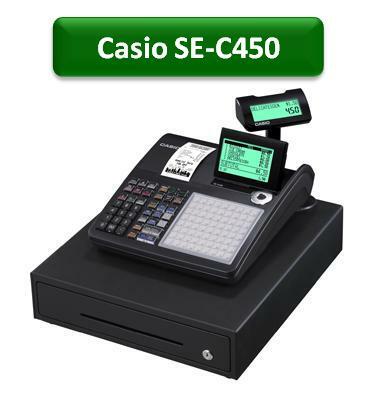 The Casio SE-C450 is a single thermal roll cash register with 72 flat PLU keys, ideal for businesses that require a visual rich display at a glance. 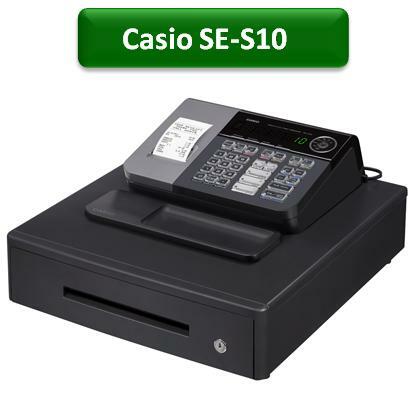 This machine has all the same features and benefits as the Casio SE-S400. 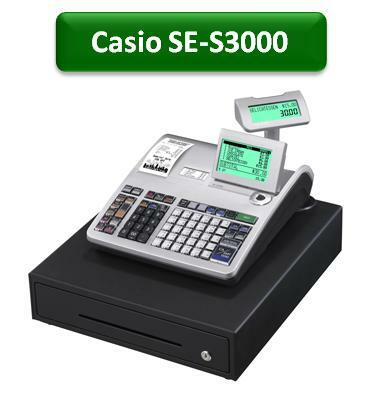 The Casio SE-S3000 with twin thermal rolls and 30 raised buttons. Clerk interrupt is available to improve efficiency behind the bar. This machine is also excellent as an entry level scanning terminal (7000 items). Features also include review of previous sales and pre-set cash amount tendered keys with the ability to create new scanning items on the fly. The Casio SE-C3500 with twin thermal roll and 72 flat PLU keys is ideal for businesses that require a visual audit roll at a glance. Clerk interrupt is available to improve efficiency behind the bar. This machine is also excellent as an entry level scanning terminal (7000 items). Features also include review of previous sales and pre-set cash amount tendered keys with the ability to create new scanning items on the fly. All content © 2018 Cash Register Services, Unit 23, Boulevard Factory Units, Hull HU3 4AY, "CASIO" is a registered trademark of CASIO COMPUTER CO., LTD.